Never in my wildest dreams would I have believed anyone that Wyatt could be where he’s at now simply by introducing him to some basic ASL signs. Here was a kid who was completely non-verbal and had meltdowns every single day, multiple times a day. He was the kid who had a meltdown simply for being in the same room as a therapist. No medical professional knew how to help us. There was no silver lining. We had essentially given up hope that his behavior would ever change. Communication and behavior progress seemed impossible. It was out of pure desperation that we decided to stop therapies altogether and introduce signs. That decision came with an enormous amount of guilt for not being able to help our son, for going against the recommended standard therapies, and therefore the fear of failing as a parent. But we had no options left. The medical alternative we were given was to medicate him to keep him calm. That was not an option in our book. That was the point when I decided to trust my intuition. Medicating him into a drowsy state would not teach him to communicate and deal with frustration. We had to go out on a whim and cross all fingers and toes. Making that bold decision also meant that we had a very lonely road ahead of us because no one had dealt with this severity of a behavior before where every meltdown was a life-threatening emergency. I can’t speak for my husband but I personally felt that everything we had tried was unsuccessful and that if we kept going like this, the next breath holding episode might kill our son. “Pain is a necessary process of growth”, so I’ve been told. Desperation when you’re trying to help your own child falls right in line with that. So, I made the only decision I felt I could and dove in head first, immersed myself in ASL vocabulary, modeled the signs daily, all while clinging on to the mere hope that it will pay off. And let me tell you, it did pay off in more ways than I could have ever imagined! I was simply hoping for Wyatt to learn to tell me his very basic wants and needs so the frustration at home would ease. Instead, he exceeded my wildest imagination. Not only did he start to recognize the signs and eventually sign them back but his whole behavior changed. As his vocabulary grew he became less and less frustrated. He started to voluntarily interact with the people around him, which was something he had never done before. He learned to read and imitate facial expressions and body language and even showed empathy. If you have experience with Autism, you know that those are HUGE milestones that some kids on the spectrum never meet. He’s now excited to tell me about his day and invites me to play with him, he even engages in pretend play. But what really touched me the most is that he now wants human contact. Every parent wants their child to hug them, snuggle up with them on the couch and show them they love them. Those moments didn’t happen for us for several years. Wyatt didn’t want to be touched, he didn’t want to engage. I am happy to say that Wyatt now WANTS to give and receive hug, he now wants snuggle time and he loves when we blow bubbles on his belly. I will never take those moments for granted because it took us taking a giant leap of faith and many years of patience and hard work to now have those moments with him. Though they seem minor in comparison to the human connection we've built with our son, there have also been other communication benefits that we could not have foreseen. For a reason unbeknownst to us, Wyatt to this day at 5 years old seems to comprehend signed language better than spoken language. Even though he was already 3 years old when he started signing back consistently, he only started making vocal attempts when he knew the ASL sign first. It could be a matter of self-confidence on his part to make sure he is understood even if the spoken word does not come out clearly. We don’t know the reason. Either way, we saw how much of an impact signing had on him and how much growth it produced, so we stuck with it. He still struggles with oral language but he can always tell us what’s on his mind by signing! Isn’t that the goal of every parent, to understand and communicate with your child? Speech is nice but communication is what builds that parent-child bond! 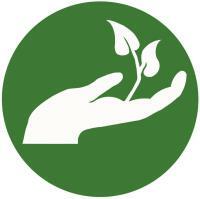 Join my Facebook Group "Communication WITHOUT Boundaries" for signing and caregiver support! You can also find me on YouTube! I always knew growing up that I wanted a big family. When we found out I was pregnant with my fifth child my husband and I decided that I would have my tubes tied. Five was a good number and I felt we had contributed our share to society. Well apparently God had other plans. During my c-section my doctor was unable to find one of my tubes so we decided to fore go the ligation. Well 8 months later we decided we wanted one more. We had 3 boys and 2 girls so we said why not, one more girl to make it even. We tried for a few months with no luck, then we tried Clomid to increase my ovulation, well 2 months of that was enough for me. The side effects were way too harsh. After another 3 or 4 months we decided to leave it in God’s hands. Well, three days before my 31st birthday I got a positive pregnancy test. This is where our journey began. From the beginning this pregnancy was different. I bled on and off for the first three months and was terrified that I would lose this pregnancy. As we approached the second trimester the fear started to ease. I soon found out that we were indeed completing our family with a baby girl an even team of three and three. Weeks were turning to months and slowly I started to feel uneasy. Isabel was not as active as my other pregnancies but the doctor chalked that up to my anterior placenta. He said I probably couldn’t feel all the moves because my placenta was in the front of my uterus and not the back. I tried to accept this but my mommy instinct knew better. I always loved being pregnant but with this pregnancy I did not feel the same. I didn’t FEEL pregnant, I couldn’t excited and I had an overwhelming feeling of doom. I knew I was at a high risk for complications with an anterior placenta and a previous c-section scar, I really thought I was going to die and not get to see my little girl, I thought the fear of doom was about me. Well, I was close but not quite. On a snowy morning in December of 2013, the 14th to be exact I delivered a beautiful 7lb 8oz baby girl via c-section. She would change my life from the moment she was born. Imagine being strapped down to an operating table and hearing the words “can I get some help with this baby! !” My baby girl needed to be resuscitated. 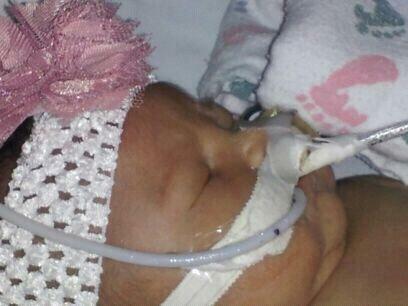 They got her breathing gave me a chance to kiss her and whisked her off to the NICU. 24 hours later she got the all clear and was in my room, this is when I noticed my baby girl was special. You try to convince yourself as a parent that the little things you are noticing are OK, because every momma wants her baby to be OK. The more I held her the more I noticed, a floppy ear, clenched fists held against her chest, and something was just different in her face. I will confess I was sad, I was confused and I tried to cover up her differences. Not because I was ashamed but because I did not want anyone looking at my little girl in a different way. People can be cruel and I was not ready for the questions or remarks. The doctors assured me she was fine and we went home 3 days later. All was not fine. At 5 days old Isabel coded at home, we started chest compressions, rescue breathes and called 911. I will never forget looking at my little girl turn purple and thinking I was going to lose her. Well that night I cried to her in the hospital and said how sorry I was for not being more accepting of her differences and for being scared about having a special child. I promised her if she pulled through this I would be her number 1 advocate and the most amazing mother to her. Well baby girl listened and 2 days later we were sent home with a diagnosis of an ALTE Apparent Life Threatening Event. The doctors assured me this would not happen again. Isabel has the mosaic form, so only 20% of her cells have an extra 13th Chromosome. She does not have any major heart or brain issues, the doctors were honest and said they just don’t know. They don’t know enough about mosaicism, they can’t give us a definite prognosis. Her geneticist was very adamant that she does not have any life shortening abnormalities, but of course with her underlying syndrome you just never know. Isabel is 2 ½ now. She has seizures, she is trached and g-tube fed, she has sever cognitive impairment, but she is here and she is a fighter. Isabel will be attending pre-school in the fall and I think she will do great. There are days when I can look at her at almost forget about her syndrome. Those are the days I love the most. Then the moment will hit when she seizes, runs a 105 temp, or just gets sick. Those days are unbearable. I cry and I fear and I always wonder if this is it. I never bought bigger size clothing for Isabel, and I never allowed myself to think in the future. I often wonder what will happen when it comes time for her to go. I wonder if she will feel it, will she know she is leaving us, will she be sad or scared. Through my tears I type this because it is a though NO PARENT should ever have to face. I love that little girl with every inch of my being. I confess I get angry with Trisomy, I want more for her, I want her to experience everything life has to offer. I wonder how Isabel would be without it. What would her personality be like? What would she want to be when she grows up? Would she want a lot of kids like me? I will never get the answers to these questions. Yes, I am angry but I am also thankful. Isabel is here and she is fighting and she is living. Then I realize Isabel had the best of everything, she knows nothing more than love, happiness and comfort. She gets more heartfelt love from her parents and her amazing siblings than most people get in a lifetime. Her Trisomy does not define her, Isabel charts her own course. She has taught our family to love, to enjoy and to LIVE!! The little things are less important in life now. The dishes can stay dirty long enough to watch a family movie, the living room can stay cluttered so we can camp out on the floor. Memories are what life is made of. I still don’t know what the future will hold for Isabel. Honestly, do any of us know what the future holds for us? They are children that pass suddenly and parents who wish they had more time. Thankfully I have the knowledge of the unforeseeable. I know to enjoy each moment and make the best of it. I try not to allow my thoughts to wander to far, that would just drive me crazy. 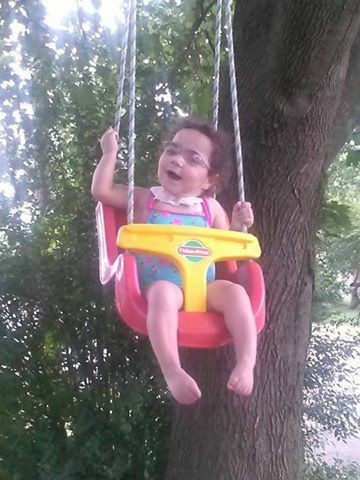 Every time I hear of a child with Isabel’s syndrome dying the thoughts flood me again. Many of friends are on the other side of this journey, their children are playing together in heaven. I find strength in them and admiration, I know when it’s time they will be rocks. I have a friend whose daughter is mosaic like Isabel and she is 25, I find her hope in her and she has become one of my closest friends. I will love Isabel and care for her for as long as she allows me to. I know I was chosen to be her mom for a reason and I embrace it. I am a better person and mother because of Isabel and I could never thank her enough for that. ​​I will say that I have done a pretty good job in masking my fears of not really what the future holds but more what is about to come. I think we as mothers of medically fragile children actually have chronic-traumatic stress disorder (CTSD) and not PTSD. Like our children who live with chronic disorders and illnesses it is all the time, no break, no days off, follows you around ready to pounce on you trauma. So what do you do with CTSD? I am certainly not the one to tell you the best way to handle it, however we can look at our children who deal with being chronically ill and see how they deal with it. Mighty Z just pushes on through although I am not as brave, tough, or as resilient I can take my cues from her. Mighty Z looks at everything with laughter and humor so I need to do the same. I need to make time for myself so that my whole world isn’t centered on her disease and what is around the corner. I have spent 15 years trying to keep her alive and trying to give her a life worth living when I should have carved out a time for myself as well. I bought into the lie that having a child who is medically fragile is “a life for a life”, but I am starting to see it doesn’t have to be. I think what we really need is caregiver fatigue management and I am trying to figure out what that is and how I can carve that into my day. I am sure I will always have CTSD, but I don’t think that CTSD will have me much longer. When you have a child who is medically fragile and have gone through stuff that no mother should ever have to see; you are often told that your panic attacks are due to PTSD (post-traumatic stress disorder) from doctors, therapists, family members, and friends. This is truer then I like to admit. Yes there horrors from the past with Mighty Z that wake me up in the middle of the night in cold sweats feeling shaky as my heart pounds in my chest, yes there are noises and smells that bring me back to a traumatic time where I almost lost her. However, what is harder to deal with is not really the past trauma but the current any moment trauma that has yet to happen, but surely will happen any given moment. It is hard to stay in the present and to not give into the trauma that is lurking around the next corner waiting to pop out at you any moment. We were a mom and dad of many, happily married and expecting another child. Number nine! It felt rather unreasonable. “God,” we prayed, “isn’t this a little too much to ask?” We’d need a bigger car. Bigger than our big car. Bigger than the Suburban! We laughed and cried and laughed again. As the technician probed, she stopped chatting, which meant something wasn’t right. There was a marker. We needed to do more tests. The heart looked dark, like there might be an issue. I’d never had testing before, but I agreed. We found out it was Down syndrome, and my best friend in the neighborhood drove over, and before I could try to joke it off, she hugged me. I remember that hug. It was like God bracing me, saying it would be okay. It gave me strength for what came next. 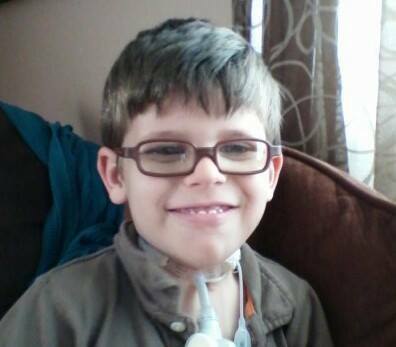 The doctors said he — Paul would be his name — also had a heart defect. We spent the next few months half the time worrying Paul would die in utero, and half the time worrying about what he would be like. My husband tried to brace me for the possibility we could lose him, and I held onto every kick as a reassurance, a fake guarantee, and wished he would kick more. Down syndrome didn’t seem like as big a deal as the open heart surgery. People live with Down — we’d deal with it when we got there — but no one should hear “newborn” and “open heart surgery” in the same sentence. Talking about hearts the size of walnuts being broken open — it was the stuff of miracles and nightmares. Paul was born, and we kept expecting him to look different. He didn’t really — only his eyes and his toes betrayed his condition. He was Paul, and he was beautiful. The next two months blurred together as we tried to get him to gain weight. We went to the doctor’s office once a week to weigh him. We made formula in a way designed to get as many calories into him as possible. I felt like the witch in Hansel and Gretel, trying to fatten him up. Eat, my baby, eat! It didn’t work. On Oct. 30, 2008, I took him for a weigh-in. The doctor listened to his heart, weighed him and listened again. She told me, “It’s time,” and gave me a long hug. I didn’t understand what was to come. However, I remember the hug. Again, God used someone to brace me for the next trial. It was time to take him to the hospital. He could no longer be kept at home. To keep him alive, they’d have to supervise his calorie intake, monitor his heart and watch to make sure his kidneys didn’t fail. She called an ambulance to take me with him to the hospital. I spent the next month at Children’s Hospital, alone with my child, sleeping on a couch, eating out of a vending machine and watching Ratatouille. The day they transferred him from the hospital to the Children’s Home, I freaked out. They wanted him to grow; he wasn’t getting bigger. The insurance wanted him out of the hospital until the surgery, but no one knew when the surgery would take place. The only guideline was “bigger.” Except he’d lost two ounces since coming to the hospital. How long before the surgery? How long could I be away from my other eight children and my husband? Were we just running out the clock? How long can we wait before he might die? I screamed at the doctor. Recognizing the post-partum she’s-been-away-from-home-for-a-month-and-her-baby-is-no-better syndrome, the doctor took my son into his arms. He put one hand on my shoulder, bracing me. “I’ll hold him,” he said. “You have to trust me. I know how precious life is.” And he told me about being held at gunpoint in his native town in South America, and talking the fighters out of shooting him or the children with him, because he could treat one of the soldier’s wounds. His words, “You have to trust me,” felt like God speaking to my heart. I slept hard that night, the first full night in weeks. That doctor had written a note, along with an analysis of the data of Paul’s weight loss and the recent spike in temperature, recommending surgery within the week. I never saw the doctor again, but I owe him my son’s health, and probably my sanity. The surgery was performed quickly, and three weeks later Paul and I came home for good. It felt like it was his birthday. We had emerged from the tomb. He’d been given a whole new heart out of the old one that didn’t have a wall or enough valves to sustain him. Today, Paul is seven. He plays with trains and dinosaurs and just came and demanded to put on his Iron Man costume. The hugs he gives are reminders of those three moments when I fell, and God picked me up through other people. Down syndrome is a reality. He’s still mastering potty training. We’re still mastering communication. However, having him is like having any of our other children, someone we didn’t know we couldn’t live without. Your daughter may be shorter than most, and she may have frequent ear infections, and her heart and kidney will have to be checked for any abnormalities. Her hearing may not be perfect, and she may struggle with spacial reasoning (reading maps, math). She may also be infertile. Yes, I know this is hard to hear as a parent. But there are parents out there just like you, and the Turner syndrome community is amazing. Please reach out for support, we have all been through similar circumstances. We understand the excitement and dread at each ultrasound. We will love you and your family. “Though she be but little she is fierce.” I think that sums it up pretty well. These girls can be happy, witty, smart, and beautiful — and stubborn! They may grow slower than other babies, but that just means you get to cuddle them longer, and that’s a pretty awesome thing. 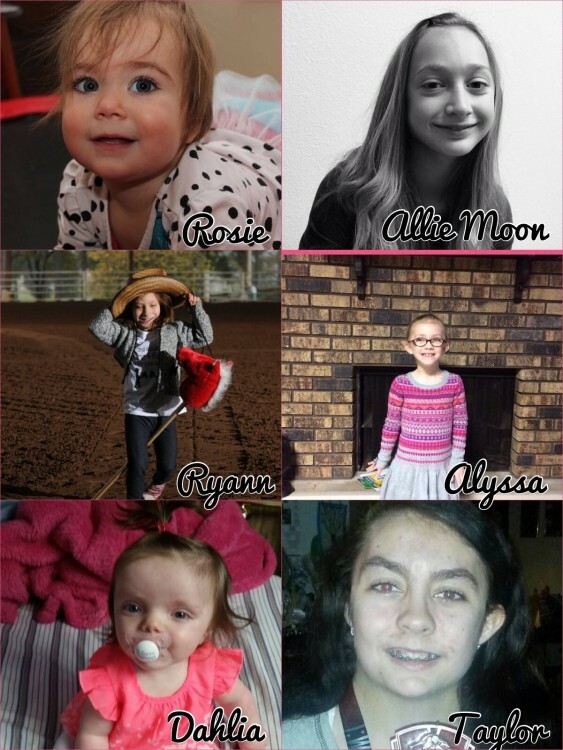 Hopefully someday when a parent Googles Turner syndrome, pictures of happy, smiling girls and women will pop up. When I was 11 weeks pregnant, we went in for that first happy ultrasound to see our little baby, only to discover she had a cystic hygroma. After the measurements were taken, we were told our baby most likely had Turner syndrome, or Down syndrome. The 16-week amniocentesis confirmed Turner syndrome. After giving us the diagnosis, the doctor sent us on our way; we were never sent to a genetic counselor. By chance I knew someone with Turner syndrome, and I had known her for several years. I thought, OK, no big deal — we can do this! Dear mom and dad expecting a precious baby with Turner syndrome, Despite any pressure your doctors may have given you, you don’t have to have an abortion. Your baby girl is very special. I will not lie, there is a chance that your baby will not make it. But there is also a chance she will! You didn’t do anything wrong! This is just a fluke thing that happens; there is no blame to be placed. You will become familiar with lots of new medical terms and specialists. Your pregnancy will likely be stressful, but please don’t let that take your joy away. She is safe and warm with you, and all she knows is your love. ​Only twice in my life have I ever had dreams about my father. He passed away when I was three. I remember waking up from the strangest dream about him. Like most eight months pregnant women, I woke up to once again waddle to the toilet. Slowly lowering myself onto the toilet I had a gush of water. I was startled by this unexpected gush; it was gushing out with each move I made. I yelled for my husband saying, “Kyle, my water just broke! This is it.” He rushed into the bathroom sliding in the amniotic fluid and slid into the wall. I started laughing hysterically-- it was like something from out of the movies. As I laughed, more and more water was rushing onto the floor. I stood in the bath tub barking out orders to my wide-eyed hubby. Thank goodness our bags were already packed from a labor scare the day before. We arrived to the hospital where the nurses checked me and tested the fluid to make sure it was amniotic fluid. (So silly and a waste of time, I thought. This was my third baby and I knew what water breaking felt like). However, I was only one cm dilated, had very small contractions, and our sweet baby girl was still moving around. Hours later and still I was progressing slowly. My doctor came in all smiles. She gave me the decision that would forever change my life. She said I could stay in our local hospital and deliver our baby, go to a bigger hospital locally, or to Dallas. Her reasoning was that I was progressing slowly and if I needed anesthesia for any reason they would have to call the “on call doctor”. It could take him to an hour to get there. I talked it over with my husband and we both agreed to go to Dallas. We wanted to be so careful and I wanted the best for our little girl. We took the ambulance to Dallas and got into our room. The meds where started, pushing me deep into labor and then I had the wonderful epidural. My mother and my best friend had arrived and were patiently awaiting Bailey’s arrival. After around 36 hours of labor I started pushing. Our doctor stopped mid push to tell me Bailey’s head was tilted and she would need to use forceps to pull her out. She explained that if we didn’t I would need a C-section. As she proceeded to pull Bailey and turn her, she said “I see hair.” I pushed with all I had and out Bailey came. The doctor laid my baby onto my chest and all we heard was silence. Bailey wasn’t crying and I touched the top of her hair and said in a panic, “She is not crying!” That is when everything went crazy. Someone grabbed my baby from me. A wave of people flooded my room. A tall grey-haired doctor began working on my beautiful, lifeless baby. He pumped her chest and from time to time he said breath. I counted each time he said breath. It was a total of three. I looked to my family in the room and saw sheer terror on their faces. Everyone was so still. No tears, no words, no comfort. The OB was still between my legs working and was not looking towards my baby. This is not how it was supposed to be. My husband was supposed to be cutting the cord. I was supposed to be counting her fingers and toes. Instead they were rushing her from the room. My husband was close behind. I’m not at all sure where time went from there. I know my best friend left, my mother was with me, and my husband was not. I think someone must have told me they were taking my baby to the Children’s hospital next door to be placed on a cooling blanket. I remember the nurses not looking me in the eyes. I remember the room they put me in. I don’t remember time. I felt like I was watching myself from some other place; this wasn’t my life. This was a nightmare. All the while my husband was dealing with the worst moment of his life all alone. He told me later how Bailey flat lined on the way to the hospital. This was the second time our daughter died. Some women were parked in the medic bay and the ambulance took off their mirror. They were yelling at the ambulance and my husband yelled “That’s my daughter in there!” He sat outside of the ER room where doctors and medical staff worked diligently on Bailey. People kneeled down in front of him checking on him. I’m sure he was in a hellish daze; the Chaplin was brought down to comfort him. A doctor finally came and spoke to my husband. She explained that Bailey had suffered a severe hypoxic event. It happens to 1 out of a 1000 babies. There is no reason for her to be basically born dead. She had a heartbeat all through labor. The moment she came out, she stopped breathing. A child that is born with lack of oxygen suffers a condition called Hypoxic-Ischemic Encephalopathy (HIE). The doctor told my husband about how that lack of oxygen most definitely will have affected her brain. She also said that Bailey had a 50/50 chance of making it that night. My husband asked her about placing her on the cooling blanket and what that meant. The doctor asked what time Bailey was born. Kyle said almost 5 and half hours ago. Knowing that a baby needs to be put on the cooling blanket by 6 hours of age to reduce brain damage up to 20%, the doctor rushed out to get our baby started. The cooling blanket basically puts a baby into hypothermia thereby reducing the damage and helping prevent cells from dying. The child’s core temperature is lowered to between 33.5 and 35 degrees Celsius from the normal temperature of 37 degrees. This process takes 72 hours. I eagerly awaited my husband. I’m not sure what happened in those six hours my husband was away. I don’t remember if I even spoke a word. I was in complete panic and terror. When my husband finally returned, he was pale and frail looking. He was forever changed. He explained to me what all had happened. We were in shock; all we had was each other in this horrific moment. I melted into him; I thought about what a good man he was and how all I wanted was to share our love with our child, how he deserved to be a father. I was hysterical on the inside. I’ll never forget that at the moment I was questioning internally Why, God, is this happening?, a nurse walked into my room. She started asking if I was okay. I told her how our baby was only given a 50% chance of living through the night. She said “You know what? You got yourself a praying nurse tonight. If you would like we can pray together.” My husband, the nurse, and I formed a circle of hands and she prayed aloud. She prayed that God’s will would be done and prayed for strength for Kyle and me. What I wanted to do was fall on my knees and pray for my baby-- the baby I had carried and dreamed of for the past 8 months. The baby whose room my dad had painted the perfect shade of pink. Her little swing that I put together and the crib her big brother helped build. Each hour that we hadn’t received a phone call was another hour my baby was alive. That was the longest night of my life. I was still feeling the effects of the meds and the exhaustion of labor. I think I slept; I’m really not sure. What I am sure of is we didn’t receive a phone call that night. 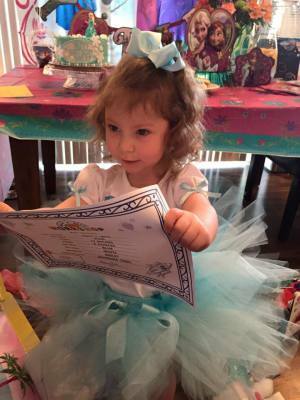 By the next morning, Bailey was off all heart medications and had experienced no seizures. Seizures go hand in hand with brain damage. They can be a side effect of brain damage and they can cause more damage as well. I felt that tiny seed of hope grow. My husband went to visit Bailey as did as our family. I got to see pictures of my beautiful baby girl. A nurse had put a crocheted pink flower on the side of her mask. She looked like a little girl. She had round chubby cheeks and her daddy’s toes. 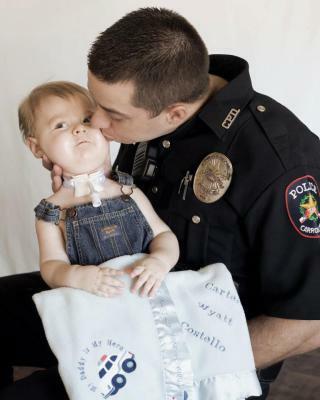 Her little body was bruised from the CPR and she was intubated for safety. She was on room air which was wonderful. I got to watch videos of her daddy talking to her. She would move her feet when she heard his voice, just like when he would talk to her in my tummy. I couldn’t even process the emotions I had. Where to start? I was angry that I wasn’t with her, happy she was here, jealous others where with her, sad, so so sad, exhausted, and fearful. I tried to just make it, tried to push myself to get up and walk. I started pumping milk for Bailey. The only thing I could do for my precious sick baby was make her milk. Doctors came and went. The doctor that delivered Bailey came to see me. She had a few others with her in a team. I’m guessing she must have needed support as well. She came and held my hand and told me she was a realist and that something would be wrong with Bailey due to her time without oxygen. I just nodded and thanked her for doing all she could. I just wanted to be alone. Every moment I had to talk to someone was a moment I was not praying and begging God for my daughter’s life. Nothing else mattered but my endless rambling prayers and making milk. It was day two, the day I would get to meet my baby. I still had the IV in my arm as my mother-in-law supported my shaky body down the long stretch of the hospital. It was a beautiful hospital just for children, filled with bright colors, butterflies, and twinkling lights that looked like stars. It was the longest walk of my life. I wanted to run to Bailey. We went through the security of the NICU. Walking through the automatic doors, the first bed on the left was Bailey’s. I turned the corner and there she was. She had her little arm sticking straight up in the air and it looked like she was waving. My mother-in-law gasped and said, “Look, she is waving!” Inside the little bed was my sweet baby. She had tubes going everywhere. Machines beeped and flashed. I can’t describe how she looked after having two rounds of CPR. Her head was scabbed and shaved on each side where they tried to insert an IV. My heart was beating hard as I got to touch her little hand. The soft baby skin of her hand was so perfect. I got to count her little fingers and toes. I was so afraid to breathe and time was racing by. My hospital had only given me two hours to go visit my Bailey. It’s the most horrific feeling walking away from your baby. There is nothing right about it. Every part of my body ached for her. I shouldn’t be walking out the door. Bailey should be with me, nursing and sleeping. My hospital room should be full of balloons and flowers. People should be calling and coming to visit, not me heading empty back to my hospital. This night I screamed and cried for my baby. My body shook as I cried hysterically. My IV had blown and the nurses wanted to put a new one in. That seemed so minute compared to what was happening to my baby. I was angry. So I prayed. This was the night I started meditation. I would picture in my head God’s light healing my baby. If I couldn’t be with her I would send my constant prayers. The thought of holding my baby got me through that night. It seems that when you have an extremely sick child it’s the little moments that keep you going. I learned to live for those moments. Though we may have been in the hospital, in my mind we were home. I got to hold my sweet baby. Finally I kissed her little forehead. We could see the dimples in her shoulder blades. We debated over her nose and her lips. I had never been more in love with my husband than in that moment. We were a family. Bailey’s lab work continued to get worse. Her liver was failing and possibly her kidneys. Her stomach was possibly dead from the lack of oxygen. We didn’t know because she had only had IV fluids and no milk. Her heart had two holes in it from not taking the initial first breath a baby takes when it is born. When a baby takes that first breath it closes those holes. She was having problems with her white blood cells and clotting. She was receiving blood products and was put back on the vent. Her bilirubin's were extremely high from the liver problems and she was turning neon yellow. One nurse practitioner stated that Bailey was the sickest baby in the NICU. I sat next to her little hospital bed. I prayed. I meditated envisioning God healing each new part of the body her doctors said was failing. The only bright spot we had was the nurses. Each day a nurse would let us have some little bit of normalcy. My husband got to change a diaper for the first time. I got to pick out Bailey’s socks. We got to suction her nose and check her temperature. Every three hours we had touch time. Though we were helping medically, it gave us a deeper purpose. Around this time is when we started getting the “Looks”. The staff would try to avoid our gaze or have this pity look on their face with a fake smile. I avoided rounds in the morning. I wanted to hear what was going on just from the nurse, not a whole team of doctors with no bed side manner. Hours and days ticked by. We became pros at watching the monitors. I held our sweet baby as often as I could. Her little body was so swollen and yellow. I found ways to comfort her by stroking her hair or kissing her forehead. My husband sang to her (sometimes a bit too loud, lol), read to her, and cuddled her. Her blood work got worse; it was possible kidney and liver failure. 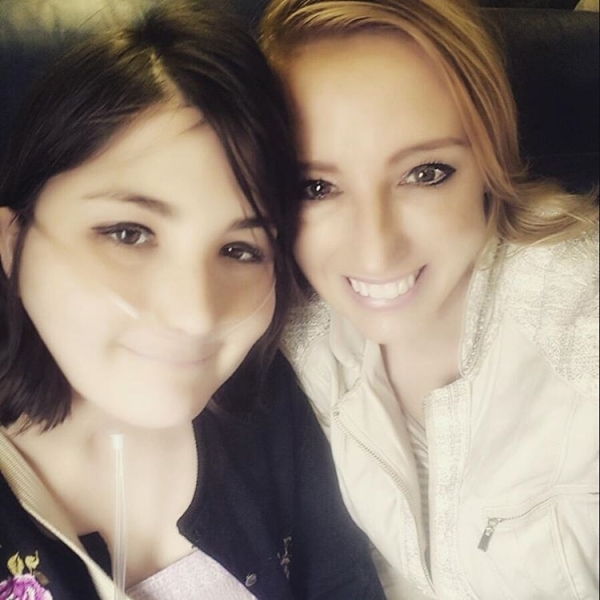 Her doctor ordered an ammonia test to see basically how fast her cells where dying. An hour later I walked past the nurses’ station. Bailey’s doctor was sitting at the desk. She was crying. I looked down to the floor praying for whatever baby this doctor was so upset about, thinking this couldn’t be my baby. Soon she rounded the corner and entered our little room. I was holding Bailey’s hand and my husband was on the other side of her bed. In that moment I wanted the truth. I didn’t want to continue with this back and forth of info. This is good and this isn’t, but this is okay but maybe this test will show this, blah blah blah. The doctor sat next to me with tears in her eyes. I asked her the question no parent should ever have to ask. Is she dying? Her doctor said “I believe she is.” I asked “Is she in pain?” The doctor said, “I think she is suffering and it would be the humane thing to take her off life support.” I couldn’t breathe. I felt nauseated. I cried looking at my baby sleeping so sweetly even with the monitors beeping. The doctor said that liver failure is a horrible death. She told me how she had treated other patients in this situation and there wasn’t a good outcome, and that since Bailey had brain damage she would never qualify for a liver transplant. My husband and I wept and held each other. We took turns falling apart and being strong. We made the calls for anyone who wanted to meet Bailey that this would be her last weekend with us. Our friends and family came. Everyone, including us, spent as much time with her as possible in, what we thought, would have been her last 2 days on earth. Bailey’s nurses helped us make foot prints and hand prints. It was such a normal thing to be doing with your baby. My husband decided he would get a dedication tattoo of her prints on his arm so she would always be with him. I was empty. I was dying on the inside. I couldn’t eat. I stopped pumping milk. Why should I pump anymore? She would never drink it. I struggled with every breath. This isn’t real. This isn’t right. Nothing will ever be right ever again. Sunday night we sat in Bailey’s room watching her every movement. The night nurse was talking to us about our decisions. I wanted to know how it would all happen. She explained to me they would put us in a private room. They would make her comfy on meds and let her pass. We could bring her little clothes and her blankets with her sweet name Bailey Faith monogrammed on them. We could give her a real bath and put lotion on her skin. The nurse said if I wanted I could hold Bailey as she passed. I told the nurse that I brought Bailey into this world and that I would hold her as she left. I know it sounds odd but the thought of dressing her and bathing her gave me such comfort. I could enjoy my baby for a minute. We could take pictures of her sweet face not covered by the vent. We would be able to kiss her and smell her hair. We would be able to kiss her little toes and cuddle her little body. Our mothers decided they would be there as well. I told them I completely understood if they couldn’t be. I would never ask anyone to witness what we were about to. The nurse called for funeral pamphlets to be delivered by the morning. Monday morning we were to have our “Care” meeting. I hate that they named those meetings “Care”. I woke up from a restless night of sobbing and nightmares. Kyle called my original OB and had her call in a prescription for me in case I needed to be calmed. I have never screamed in my head before. I screamed at God in my head! I screamed that this wasn’t what was supposed to be happening. This wasn’t right. We were good people. My husband is an amazing step dad and husband. I wanted to give him a healthy baby-- not any baby, THIS baby. I couldn’t understand how the world could still be going on as normal as could be while this tragedy was happening. How could people be laughing and smiling when this was happening!? I was empty. I had nothing to say to anyone. I called the hospital to check on how Bailey’s night had gone. One of our normal nurses answered. Instead of her saying the normal that Bailey was “ok”, she said “You need to be here for rounds this morning. How fast can you get here?” I told her we were on our way. Kyle, his mom, and I walked into Bailey’s room right as the cluster of doctors rounded the corner. They went through their normal routine of her list of complications and birth. Then they went to her blood work. My mother-in-law was holding Bailey. We where half listening to the doctors when we heard the words I will never forget. Her liver has improved! The doctors all looked up from their computers to see our reactions. They confirmed it again and again and probably again. Her liver had started to heal itself over the weekend! The same doctor who advised on Friday to take her off life support stated that she had never changed her mind in her entire career until now. That moment forward we could see the miracle unfolding. We all three sat there staring at each other for what seemed like hours. This is our miracle. The charge nurse came to us and told us she had only witnessed one other miracle like this in 20 years. After the liver starts to heal it rarely goes back. From that day forward Bailey was in control. She healed her liver. She came off the vent. She started eating and then pooping! Her stomach was working. She started opening her eyes. Bailey would cry and wanted to be held. All the things a healthy baby would do. Bailey did. She could track things with her eyes. She held our fingers. We could smile again. The doctor didn’t think we understood, but we understood perfectly. When you have been faced with a life without a child, things like normal tests results don’t matter if they are livable. My husband told the doctor that it was okay: he would be the biggest cheerleader they had ever seen at the Special Olympics! I still at times envision him in a skirt and pompoms. Ever since the decision from week 2 not to take her off life support, and to give her a chance to live, her organs kept improving. Lab results, while still in a cautious state, started to slowly improve, which made doctors and everyone agree that she really was going to survive. Slowly, over the course of being in the NICU from week 2 to week 7, medicines to keep her alive started going away, including blood products, nutrition IV’s, and anything else that was keeping her alive. She started feeding on bottles, started receiving physical and occupational therapy in the hospital, and the therapists were blown away by her progress because of what she went through. 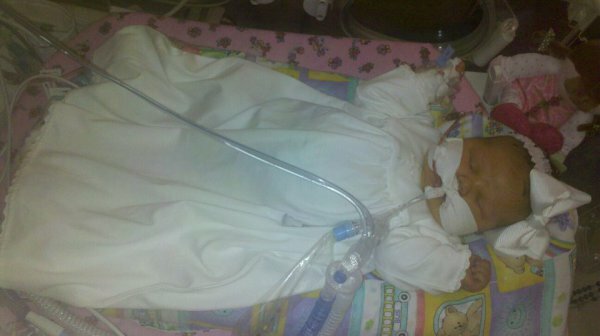 Bailey had an NG tube, which is a tube that went from her nose into her stomach. We were advised that it would be best to have a surgical procedure to where there would be a hole made into Bailey’s stomach that a machine would hook onto to. This would feed her. I thought about this and it didn’t seem right. Every time we had given Bailey a chance to do something, she did it. They hadn’t even worked with her on bottle feeding but two times! I understood the risk in both but after her rough start there was no way I wanted to have surgery without giving her a chance. So we started speech therapy. It was slow but she was taking milk. We had a swallow study done and she was drinking perfectly. Cardiologists started coming into the picture around this time. It was around week 6, and the holes in her heart have not closed. Normally they do by now and after this age don’t close on its own. The doctors thought that we would need to have a surgery done involving a small catheter to close the two holes. A few days later, an ultrasound was preformed. Guess what?!?! One hole had closed itself and the other closing as well. By week 7, it was agreed by all doctors and therapists that Bailey was healed and recovered enough to go home. I finally got to nest. I went home and washed everything that would stay still long enough to let me clean it. I rewashed her little pink sheets and footy pj’s. I arranged her toys. It was one of the happiest moments of my entire life, cleaning for Bailey. Around week 8 Bailey came home. She came home to her two older brothers and her pink room. (She has never slept a night in that room.) Upon discharge nursing was arranged as well as therapists. Nursing came one time to make sure we were comfortable inserting her NG tube into her stomach. Physical therapists came and played with her and watched her. They decided she didn’t need therapy. We thought that when we left the hospital our lives would be constant therapist and doctor appointments. The only therapy she received was speech to help her with bottle feeding. At five months she was completely orally feed. She was discharged from cardiology right away with no more holes in her heart. Her liver is normal, just annual tests. She only has one kidney but as the doctor explained, millions of people walk around every day with only one and don’t even know it. Her kidney is growing with her. Bailey is now 10 months old. She has met every milestone on time. She crawls and sits. She drinks bottles and eats food. She plays with her toys. Bailey said momma at around 5 months, followed by dada. Now she says baba (for bottle), momo (for no, no) duh duh (for her favorite bath toy, a duck). She has recently started pulling up to her knees and she can push her baby walker. Bailey will walk and she will talk. She knows who her momma and her daddy are. Lol. I still pray every day but boy, have my prayers changed. We don’t know what the future holds for Bailey but when we go to her doctor appointments, they call her the miracle baby. Writing my daughter’s story was one of the hardest things I have ever had to do. The reason I agreed to write it was to give hope. In our darkest moments I would have given anything for one story of hope. I hope her journey can help not only others going through this but also prove what God’s power can do when we pray. and getting sewn up so I could return to my room and await someone to come tell me the status of my baby. I return to my room and family starts swarming in. I heard worried voices, and tons of questions. Everyone hangs around for quite awhile, and still no word on my baby. Well, 11pm comes around, hours now, and we are still getting the response that the doctor was in an emergency and would be in to explain as soon as possible. My medicine is long worn off by now and I’m refusing more because the last thing I want is to be knocked out when they come to tell me did my baby make or did he not! Right about midnight, it is demanded that someone come tell us what in the world is going on. Finally a nurse agrees to let my mom, and Landon’s father back to see him. My mom was able to take a few pictures of my gorgeous little man lying there in that bed. Though he was covered in tape and gauze for IV’s he had his little diaper on and was getting oxygen via a nasal cannula. The visit was a short 5 minutes and they were asked to leave, that he could not handle stimulation. They return to show me the pictures of this beautiful, perfect, flawless skin, 10 fingers, 10 toes, long dark hair, and big brown eyed baby boy. I finally accept the fact that he’s ok, just had a rough start, and I accept my much needed pain medicine and fell asleep. 8am the morning of November 23, 2005 I am ready to work my way into a wheelchair and go see my baby for the very first time. We are, ever so kindly, stopped in the hallway by the neonatologist with some papers in hand. He begins to talk and hands us these computer printed papers that say “Mobius Syndrome” on the cover with pictures of children with facial deformities. For a minute I’m in shock, very confused as to why we were given these papers. I just saw pictures of “MY” baby boy last night and he looked nothing like this. My confusion turns to anger and I zone out of the conversation and am just ready to go see him! I can make my . own opinions of his appearance if someone would just let me SEE HIM! Off we go into the NICU, and there he lies, but now there are tubes forced down his throat held to his face with tape and plastic bars. I’m again confused and call the nurse over to ask what in the world is this on my child’s face??? She gives me the spill that they had to keep resuscitating him through the night to the point he needed to be intubated and placed on a ventilator with oxygen, yet never kindly let his parents know! Our visit was short, yet another 5 minutes and the nurse claimed it was too much stimulation. So we leave and head back to my room only to turn the corner of the hallway and find our parents and family outside my room in tears. Extremely confused now, my family begins to tell me the hospital called them and presented all of them with the same papers. Now I remind you most of them have not even seen Landon yet! Much time passes and they decided he needs to be seen by a Neurologist who would not be coming to that hospital until December 5th, so they ask my permission to load Landon into an ambulance and take him to a more specialized hospital in Baton Rouge, Louisiana. Of course I say yes as I don’t want to wait for December 5th. I start asking the nurse about removing my staples for my incision, (Landon was 3 days old) and she tells me ohh no Landon was being transferred, but I was not being discharged yet! Well, if you know me well, then I’m sure I don’t have to explain to you how this went down! something? The doctors at delivery? Yet nothing surfaced. I spent endless hours with my face smashed again the thick clear plastic sides of an incubator, not allowed to even touch him as the nurses made sure they watched like hawks so they could run up and inform me my son could not handle the stimulation. I longed to reach over and just grab him, hug him so tight, and ignore them, but I also longed for them to figure out why he was so sick, why everything was going so wrong so I could take him home. Never did I imagine what was in store for our lives ahead of us. Never did I know that I’d not be allowed to hold him for weeks, and when I finally could it would be with the guidance of many people standing around me holding breathing tubes, wires, circuits, IV lines and acting like I’d never held a baby in my life. So much for the snuggling, cuddling and squeezing tight that all mothers long for. I felt it was all ripped away from me, totally out of my control, and nothing in the world I could do but play along. Time goes by and though I cannot remember exact dates or timeframes of course it felt like forever. It was soon deemed that Landon definitely had Hirschsprung’s Disease and that his gut still was not functioning properly to potty so he went in for surgery #2 and the colostomy was then changed to an ileostomy which was higher up in his intestines at the ileum. Same thing, a little cherry red stoma was placed on his belly for him to poop from into a bag stuck to his skin, that the liquid stool was constantly emptied from and the bag itself was frequently changed due to coming unstuck and leaking a mess everywhere or just time to change the bag in general. Either way it sucked. You had to rip off the taped and waxy parts of the bags leaving his skin red, irritated and rashy, only to restick another bag on top the irritated skin. Sure there were pastes, powders, creams, etc but after awhile none of them helped his little skin. Surgery 2 went well and again it was confirmed Hirschsprung’s Disease but this time more in depth that he had full colonic Hirschsprung’s meaning most of his colon was dead, or lacking the needed cells to function properly. I was told then that some years into the future another surgery could be performed after he grew a bit to see if the bag would be a permanent thing for him or not. This was devastating enough to see him only days, weeks old, already had 2 surgeries, scars all over his little belly, tubes in his mouth, etc etc. This was not what he asked for! Now, I’m a pretty headstrong kind of person. I love to learn, and will do anything when it comes to my child, so I had my bouts with breakdowns and tear shedding in the silence and tried to keep my head held high for Landon and whatever his future may have held. I made the nurses teach me everything as it happened and I grew fonder of many of them as they did of me. I spent every waking hour I could by his side, secluded myself from the outside world. The only people that saw me were the ones who took the time to come to the hospital and come visit. I’d spend time with them at his bedside explaining what was what and what was going on, etc. This became such an exhausting thing for me that I had to get my close family to do emails and/or texts for me because though I was so grateful for their visits and concerns, repeating myself everyday just seemed to drain me more. I had plans to breastfeed Landon but of course he could not eat so I tried the pumping ordeal but it quickly started to dry up because I never got that bonding time, that skin to skin time that mommy’s and babies are supposed to get. By this time Landon had a tube up his nose that fed down to his belly to feed him. I pumped what I could and they stored it at the hospital and gave it to him until my supply ran out. We soon grew very close to two nurses in the NICU that became his two primary’s and one day one of them had the idea to let me hold him skin to skin! Oh my gosh was I excited, but it was a task! She laid his little warm body against my chest and I think I just melted. This being only the second time I got to hold him, I just didn’t want to let go. I laid my cheek upon his hairy little head and just closed my eyes. I can remember that moment like it was yesterday. He cuddled right up and fell right asleep, peaceful as could be. Of course it didn’t last forever and back to his bed he had to go. The next few weeks entailed surgery to place a feeding tube in my little man’s belly so the one down his throat could be removed and also a tracheostomy. I don’t remember perfect timing but one was before Christmas 2005 and the other was right after the New Year. In the tracheostomy surgery he also had a Broviac placed (More permanent IV that fed to his heart) and his appendix removed. The Broviac placement came into play when I had arrived one day only to find the side of my babys head shaved to the scalp! I absolutely had a cow, only to be told his IV had blew AGAIN (this became a frequent routine) and in searching for another they had to result to the head. They had gotten one in his head but it too was short lived. At least they saved me his little shaved hairs in a baggy. Yes of course I still have it. With surgeries 1-4 completed, trach, broviac, g-tube, and colostomy bag in place things slowed down a bit. Time went on, doctors continued to “guess” a diagnosis for Lan only to result in a big Negative! By this time I’m being told he’s deaf and blind. Clearly he smiles at me, is active, and full of love for life! I was quite frustrated by the claims of deafness and blindness and though I knew he was neither, arguing with those people was like talking to a brick wall. Remember I’m a first time mommy and a 20 year old. Of course they earned much respect for me and thought highly of my mothering skills but they also thought I was a mommy in denial. I wasn’t though. I just got to where the doctors told me so much in our weekly meetings and their guesswork of sitting at a computer with me googling symptom’s just trying to stick him with a diagnosis…soon got old to me. I didn’t care anymore what he had. He was my baby. He was perfect in my eyes and I would deal with whatever it was that he had and needed. I continued on this path of “teach me everything” right after each surgery. I would tell the nurses okay teach me now let me do it from now on. And they did. His NICU room soon became more like a nursery. They let me bring in a little Christmas tree, his gifts, a small dresser so we could start dressing him as wounds healed and time passed by he became more stable. He underwent 7 major surgeries while there for his 6 month stay. I brought in a little stereo and made a rule that music whether it be playtime or lullabies, music was to be played 24 hours a day. One nurse in particular thought that was ridiculous since he was deaf! We argued about it and she threw out there that he felt the vibrations of the door opening when I walked in that’s why he turned his head towards me. Whatever lady! Some doctors still came in and would pat my back asking me if I really wanted to put him through all of this, since after FINALLY diagnosing him at age 3 months, it was deemed he had the unforgiving Ondine’s Curse! Today it’s called more Haddad’s Syndrome (Congenital Central Hypoventilation Syndrome & Hirschsprung’s Disease) Needless to say I had that doctor banned from his room as I was on a mission, no negative energy in his room! If he had the will to fight, then who was I to give up on him! Never! When time to go home rolled around it was postponed many times…he would catch a hospital bug or no nurses to help me at home and the doctor hated to send me home with no help, etc etc. Finally the day came and he was almost 6 months old. It was a crazy day to say the least but we adjusted well. His nursery became nothing more than an adorable room we setup to only become a storage for medical supplies and equipment. He slept in a baby bed in my room so that I was always right next to him. Moving him during the first few months was very tense and scary. 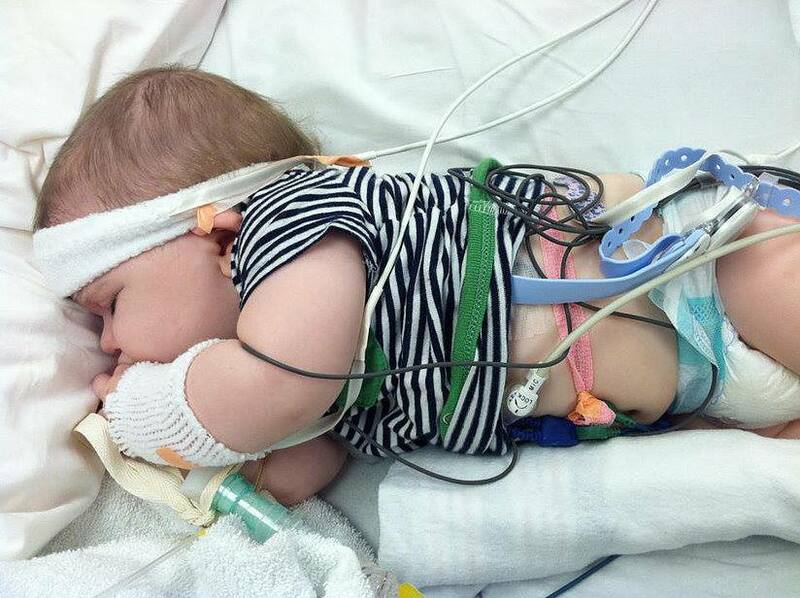 He would desaturate while trying to move his body and hold all his wires, making sure his trach never pulled out, etc. Time grew on, we built a house closer to the city as we had currently lived in the country next to my father and stepmother which was a huge help but way to far from a 911 calls response. Ambulances took about 30 minutes to get to us yet the helicopter was a lot less time. 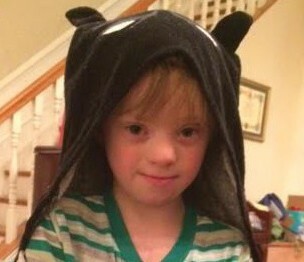 Landon continued to grow into this amazing little boy, who was bright, happy, and hilarious. He was always and still is the most loveable little mama’s boy. Landon is now 7 years old. In 2008 he was 3 years old and I took him on a long trip to Chicago to meet one of his diseases top specialists to see was he a candidate for diaphragmatic pacers. A way to keep breathing for him but without a ventilator. It was freedom for him! He was deemed a candidate but many years would pass of insurance battles to pay for the very expensive surgery, that to them was a luxury item. Yep, got to love how that implanted piece of metal that shocks your nervous system to send a message to your brain to say, hey “take a breath” was equal to asking those people for a yacht! So time moves on in our lives, where we realize the path we are heading down may not have been a long term pathway. Needless to say Landon’s father and I divorced and went our separate ways. He was a good father when he was there but that faded after the divorce, no matter how many times I reiterated “we” divorce each other, not our child. Anyhow, another saying I hold very dear to my heart is “when one door closes, a bigger, better one may open.” And I truly believe this because in 2009 when Landon was just 3 years old we met an amazing man. Though Lan and I had spent much time alone, we were doing good, and happy. I met this person through family friends and my father who all had such great things to say about him, but I didn’t care. I was content with me and Lan, haha. Sure enough it’s a setup, and the guy is actually a great guy. Well, things move forward rather quickly and he’s just amazing with Landon. From the moment he met Lan, not a single part of Landon’s life, history, medical, anything…were a burden to Mark. Mark had no children, but wanted many! He and Landon fell in love with each other, as the only full time men in Landon’s life were my father and little brother, whom Landon absolutely adores. A male figure in Lan’s life I felt was a big deal. He was always around mommy, grandmas, and female nurses. Seldom did he get social time with other children because he was too fragile with sicknesses. Mark did everything with Landon, wanting to learn everything from day one. He knew Landon’s father existed and never once tried to take his place, but he loved Landon dearly and would go any lengths to provide for him. ALL of Landon’s supplies and equipment. Let’s just say it was a task in itself. We made it to Texas, spent a couple months at my mother’s while Mark searched for a new job and we searched for a house that would accommodate Landon’s needs. Mark landed a great job and we found a beautiful house not long after. We had, had many discussions about children but needless to say I had no plans to have any more children, although all the genetic testing was done after Landon’s diagnosis and all deemed that Landon’s was actually totally spontaneous. We were not genetic carriers in any way. So the likely hood of Mark and I having a child with Landon’s disease was pretty nonexistent. Low and behold we became pregnant with another beautiful little baby boy who graced us with his presence on August 6, 2010. Another scheduled c-section, and perfect pregnancy, yet doctors were prepared for the worst! Cullen Jacob Costello was a whopping 10lb, blonde haired, crystal blue eyed, perfectly healthy baby boy! And he let out an immediate scream that let you know he was here! He was handed right into my arms, lying on my chest in the operating room and my whole world just came together. I had a wonderful man next to me, and a super excited big brother Landon waiting outside for “his baby” as he called him, and the gift of mommy baby bonding. Everything was great; surgery went well, as did recovery, so home we went within days. Things were amazing. Landon was a fantastic big brother and Cullen was the best baby ever. I remember Cullen asleep in a little crib that goes in bed with mom and dad, and I could have just stared at him for hours. I cried and cried and cried, with joy of course, but it hit me right then... that why couldn’t Landon have been given the same opportunity? Though Landon taught me so much about love, life, motherhood, and about myself, Cullen had something different to offer. I was able to feed Cullen with a bottle not a tube in his belly, I could change a diaper not an ostomy bag on his belly, I could breastfeed him and hold him close to me, I could dress him in all those cute baby clothes, all the things I had longed for with Landon. pregnancy again until the end I started having some fainting spells behind the wheel... yeah! So I was pretty much put on bed rest, and banned from driving. Marks mom came down from Rhode Island for Cullen’s birth as she planned to do again for our newest addition, Carter Wyatt Costello. But she ended up coming down a little earlier than expected in fear of an early labor. She was a huge help and glad she came early because I lost all my amniotic fluid at 36 weeks and had an unplanned quick c-section to deliver Carter whom was a scrawny, wrinkly, little thing but weighed in at 6 lbs 14 ounces. He seemed perfect just jaundice and a preemie with underdeveloped lungs that needed some growing time in the NICU. Boy did this bring back bad memories and fears. Having to be discharged without him was really hard for me. Mark was by my side but I really felt, it just didn’t hit home as hard to him, not having been through it with Landon like I had. He was very supportive, and is a great father and husband so we just made our daily trips to the NICU to feed him and nurture him. It was a short 10 days later and he was allowed to come home with what we planned to be a big surprise because it was actually Cullen’s first birthday! The boys were thrilled by their baby brother. Our family seemed complete. We had each other and our 3 boys, granted Cully and Carter were healthy, Landon kept us extremely busy so we had decided early on in the pregnancy with Carter that he would be our last little one, and I had my tubes tied in my c-section. We felt so blessed that Landon was growing strong, he finally got his pacers after years of waiting, we had been blessed with 2 new healthy little boys…we just felt complete. muscular atrophy and weakness to the point of death. There is currently no treatment and/or cure for this disorder. It affects every part of the body robbing you of the ability to not only eat, drink, swallow, but breathe, potty, and move every inch of your body. Sensation is spared and so is the mind. Leaving you with a brilliant mind trapped in a body that cannot express itself in anyway other than to move your eyes. WE WERE DEVASTATED! So then we turn the pages and start brainstorming, well he can’t possibly have this because in the three weeks it took to get the results he started moving his arms again and in SMA once you lose it you never get it back. Well November 8, 2011 came soon enough and back to Neurology we went for results. Need I tell you what they were...? Type 1, Spinal Muscular Atrophy, the worst, most severe form you can possibly have. We were informed Carter would need multiply disciplines of medical assistance if we chose to intervene at all. We were told his life expectancy was lucky to be age 2 but more like 10 months. We were told there is no treatment of any kind nor is there a cure. Somehow I was able to compose myself through this entire visit, honestly I just let it all in one ear and out the other, guess I’m good at that. The entire ride home Mark and I didn’t say too much unless we took turns blurting out all the reasons we didn’t believe it to be true. Next it hit us that it takes BOTH mom and dad to be silent carriers of the gene to give it to your child, and that there’s a 25% chance with every pregnancy. We were thinking of Cullen and how he’s healthy. Next we questioned could Cullen have it also just maybe be type 2,3, or 4, but they said NO you would still notice some sort of weakness. 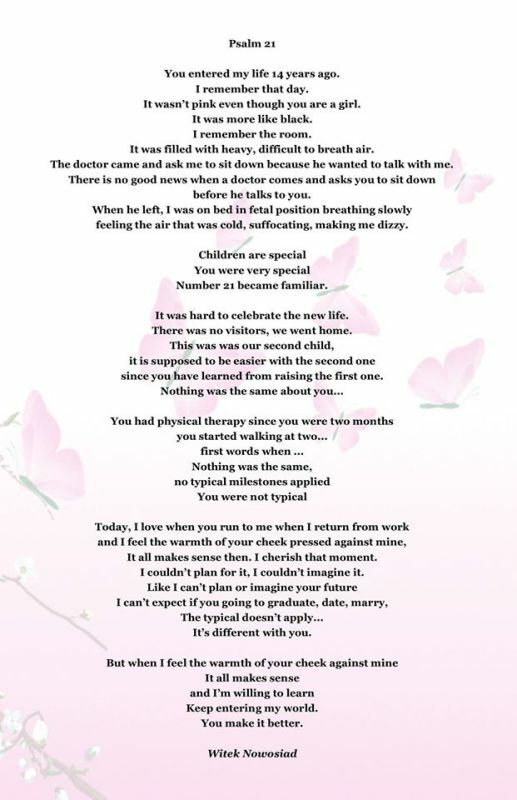 So there it is….Age 20 Landon’s born, spontaneously given CCHS, Hirsprung’s and Epilepsy, age 25 Cullen’s born perfectly healthy and age 26 Carters born, of a different father I might add, and yet had Type 1 Spinal Muscular Atrophy that he got from Mark and I… Now I take my moment to fall to pieces. Now I fall to my knees and ask the man upstairs, “WHY?? ?” really? Two children with such unforgiving, debilitating, no treatment, no cure diseases…WHY???? What in the world did I ever do in my life to deserve to watch my babies suffer to such great extents that no baby should ever endure? I had my issues with tears and short lived depression but somehow once again I managed to pull myself together. I swore I’d do everything possible to save Carter as I did Landon, and from that moment on that’s exactly what I did, with Mark right by my side. We have taken this journey beyond extremes, we have had the boy’s crash at the same time needing resuscitation, I take one, he takes the other. We have had them side by side in intensive care together for 40 days, we have had one in ICU for months while the other 2 are at home, we have had Carter and mommy leave the local ICU after months and fly across the country to another ICU in New Jersey, forced to leave daddy and brothers behind. It has been a never ending progressive roller coaster ride of tears and joy. Again, I can say, there is nothing I would change about either of the boys than for them to have been blessed with health, for their sake. But I know in my heart each of them are here for more than just a reason. Each of them have taught me so much in so many different ways, that “I” could never repay them. They have taught me to believe in things I never thought possible, they have educated me in such ways that gave me the knowledge to save other children’s lives whom might not be here today had I not met them in their times of need. I owe every bit of that to my babies, and to my husband for always putting up with me in my stressed out times, for always being my rock and my shoulder to cry on, for forgiving and forgetting my unkind words in my times of despair, and I thank the friends I met along the way, the friends that held on with me, the family support and the dedicated nurses who have become like family to us…all who pulls together to help our family, whether it’s a fundraiser, a day off of work, a grocery run, a few hours of watching the boys so Mark and I can step out of the house for a date night and pretend for just a moment all the weight on our shoulders is nonexistent. As awesome as those moments are the hardest, yet best moments are returning home to our babies. See, Mark and I have always kind of had this agreement, perhaps why we work so well together, but we don’t mind the sleepless nights, the no privacy, the no vacations, no social life, high tension stress levels we live under…because it’s what our kids needs from us. It’s not their fault, understanding it’s not ours either, but they heal faster, and smile longer when given a healthy environment, and I truly believe this. If these boys lived in an unstable home without all of the love, support, and one on one time we try to give them, the loving supportive relationship Mark and I truly have, then I don’t think our boys would be where they are today! to the 1st floor ER with Landon, fearing I’d lose one and not even be by their side. There is no way to describe such pain and exhaustion. This was such a hard time for Mark and I as he had to take leave from work the entire time due to me needing to be in one room, him in the other and the inability for us to go back and forth spreading their viruses. It was awful. But I must say we got tons of support. Grammie stayed home and took care of Cullen, who I hardly got to see and missed dearly! Marks coworkers visited often bringing prayers, social time, and food! Family came from out of state to support us as well and of course friends made their visits. It was touch and go for quite awhile with both boys, some nurses were great, other ticked us off, and some had to be banned from the boys’ rooms. We made friends and we made enemies. Some love us to this day and some turn their heads in the hall, but after all said and done I was very proud that Mark and I stood together as a team under all the stress and pressure, we backed each other up in all the medical decisions we were forced to make, all in what we felt were in our children’s best interests. We still do to this day. Our house is like a zoo ninety to nothing all day and night. We say we run the “Costello ICU!” It’s true. We have about everything in our home as does an intensive care unit. We were forced to sell our house when Carter was diagnosed and Grammie moved in to help as there was no room for her nor was the house setup to accommodate Carter’s wheelchairs. We took a huge hit on the sale of that house but were blessed to get into a new one that has been great for the boys’ needs. That was our primary goal was to get closer to Mark’s work for emergencies, closer to the hospital for emergencies, and a place for Grammie, and room for the boys and all their needs. Believe it or not after almost a year of searching we found it! It might not be on country land like we would love, but after weighing the options of 911’s response time in the city versus the country, we obviously chose the city. Maybe one day the boys will be stable enough to scoot out of the city a bit onto some peaceful land that the boys can go outside and just “be boys.” But I must say Carter’s year in 2012 was no easy one and I thank my lucky stars we chose the house we chose because he’s crashed and 911’s response to help us, along without training and knowledge was more than critical in the fact that he’s still here today. placing a tracheostomy and has never looked back. He has been growing like a weed, been spending far more time at home with us than in the hospital. He has finally outgrown his first wheelchair which was a manual chair and our awesome occupational therapist helped get him his very first powerchair! We worked together with some great people to make it happen and it is finally ready to roll. Carter has been “learning how to drive” a little bit each day as we practice around the house without destroying the walls, or we try to go around the block for a spin, which he loves, and smiles from ear to ear. That smile is something that keeps me moving forward every day, (knowing in my heart one day he could be robbed of the most precious thing that gives him his nickname, Smiley) even when people ask me why don’t we just let go. Because as long as they show us they are happy, I’ll let them make those calls. I feel like if it’s really time for them in heaven, nothing I am capable of doing down here is going to keep them here. Their minds are intact and brilliant, they are happy, they show this every second of everyday, so who am I to be the quitter? So after hours of writing and shedding tears, I have finally, after 8 years, produced a somewhat detailed summary of what these past 8 years have been like. The heartache and the happiness. I wouldn’t take back a single thing I did because maybe it would not have brought me to where I am now. The stress is truly higher and it builds by the day. I can proudly say I have never drank my way through, I have never done drugs, and I have never needed any sort of medicine to numb me to what is reality for me. Sometimes I think perhaps I’d be a much better person to be around, haha, but in the end, it is yet another accomplishment for me. I look back and sometimes and mad at myself, feeling like I could have done better at some things and of course at the early start I had in a career to only be a non-career woman now, but then I’m quickly reminded that maybe I was meant to be a doctor of some sorts, just paid with hugs, smiles, and love instead of money. For me that’s so worth every second I spend inside these walls. Don’t get me wrong, I need lunch dates with my girlfriends, I need date night with my husband, and he needs his time. We all could always do better at taking care of ourselves, but I think we fare pretty well under the circumstances. 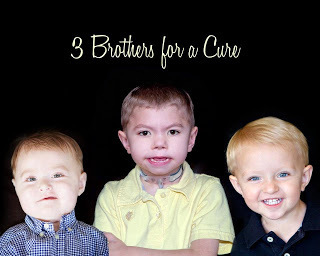 Of course we dream of winning the lottery someday and are able to provide our boys anything and everything they need now and forever to come, that I could pay my way to a cure of CCHS & SMA, but don’t we all wish those things. Maybe one day it will come true.